Kerala is an enchanting mosaic of coconut groves and paddy fields, wide beaches and labyrinthine backwaters, verdant hills and rainforests nesting between the Western Ghats and the Arabian Sea. National Geographic has credited Kerala as one of the Paradise among ten paradises on the earth. Kerala is an ideal blend for a perfect holiday destination because of its demography and its diversified cultural background. Among Indian tourists place Kerala has become the most visited place among all. It is a perfect tourist attraction with its scenic beauty, quite temples, beaches and hill stations. Kerala is full with the picturesque beauty of nature and is a place of spirituality and grandeur. Kerala, The Venice of the East, is pregnant with its prosperous culture and tradition.Large number of tourists from India and abroad visits Kerala which is loaded with various tourist destinations.Kerala is the state rich in natural resources and an extensive network of biodiversity. The backwaters and rivers form an important source of livelihood and income for the people here. Another means of livelihood in the interiors of Kerala is tourism. Tourists from abroad and within year throng the place throughout the year. The houseboat trip, tours, and places of attractions keep them engaged for at least a week. From historical to natural attractions, the diversity of Kerala lies not alone in its landscape but also in places of interest. A wildlife lover would opt for the forest of Periyar while the scenic calmness impresses a honeymooner in Kumarakom. Seafood lovers are on a voyage to the interiors of the state from Alappuzha A tourist can visit many tourist destinations in Kerala namely Trivandrum, Munnar, Thekkady, Palakkad, Alappuzha and many more. These entire tourists’s places in Kerala are much known tourist destination. These places are packed with lots of mind-blowing attractions and very rich in Kerala’s charisma and culture. In this article I am giving some tourist’s attraction of Tiruvananthpuram , the capital of Kerala. It is the capital of Kerala and until recently it was known as Trivandrum.The capital of Kerala, was earlier called Trivandrum and is known for its mild climate. The Sri Ananthapadmanabhaswamy temple, the Sri Chitra Art gallery, palaces of the family of the Maharajas of Travancore, museums and the beautiful Kovalam beach not far away, make Trivandrum a pleasant Indian holiday destination. The name of the city has been derived from the magnificent Anantha Padmanabhaswamy Temple. Tiruvananthpuram literally means—“Holy City of Ananth”, the sacred thousand –headed serpent on which Vishnu reclines. Built across seven hills, the city’s old quarter clusters around the temple, while along busy Mahatma Gandhi Road are colonial mansions, churches and modern high-rises. It is 708 KM South West of Chennai. There are many tourist’s attraction at Tiruvananthpuram which was the seat of the former royal family of Travancore from 1750 to 1956. In the city there is located in a well planned compound is a complex of museums and the city’s zoo. The Government Arts and Crafts Museum which was initially known as the Napier Museum, after a former governor of Madras, is in red and black brick. It was designed by Robert Fellows Chisholm in the 19th century. It showcases a rare collection of bronzes, stone sculptures, exquisite gold ornaments, ivory carvings and a temple chariot. All the things have been fashioned in the territories of the former kingdom of Travancore. It is situated to the north of the Museum. It is a very beautiful building that incorporates the best elements of local architecture. The works of Raja Ravi Verma (1848-1906) and his uncle Raja Raja Verma who were the pioneers of a unique academy style of painting in India, are in the proud possession of Shri Chitra Art Gallery. Ravi Verma was considered the finest Indian Artist of his time and his mythological paintings have inspired the popular religious prints found in many homes. This museum is in the eastern side of Government Arts and crafts Museum. It has a fine replica of a typical Kerala Nair wooden house which is known as, NALUKETU, which details the principles of its construction. This is the place where the Travancore royal family once entertained their guests. It is adjacent to the complex, on top of a hill. After driving for a short while down the road from the complex is Kowdiar Junction. It is a roundabout of walls and ornate railing facing the Kowdiar Palace which was former maharaja’s official residence. This temple is located within the fort that encircles the old town. In the state this is the only temple which has a towering seven storeyed GOPURA, which is very commonly seen in Tamil Nadu’s temple architecture. However the restrained ornamentation is typical of Kerala. In the huge courtyard there is a flagstaff encased in gold stands. There are 324 columns and two rows of granite pillars in the main corridor which runs around four sides of the courtyard. Each pillar is embellished with a woman bearing a lamp (deepalakshmi). There are also mythological animals sculpted with rotating stone balls in their jaws in the hall. The outer walls of the inner shrine are adorned by rich murals. There almost 6-m (20-ft) Vishnu resides with his head towards the south and feet towards the north. This museum is also known as Puthen Mallika. 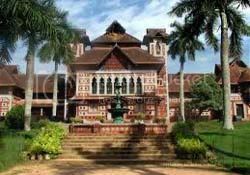 It is housed in an 18th century palace which is a fine example of Kerala architecture. 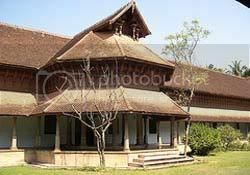 This wooden palace is built by Raja Swathi Thirunal Balarama Varma who was a statesman, poet, musician, poet and a social reformer. This wooden palace has polished floors and a sloping tiled roof. The wooden carvings are particularly noteworthy. Among all the wooden carvings the 122 horses lining the eves of the building is particularly noteworthy. On display are various artifacts from the royal collection which includes a solid crystal throne given by the Dutch and another carved out of the tusks of 50 elephants.Thiruvananthapuram has a lot to offer its tourists by way of heritage, history, art and tradition. The Kuthiramalika Palace Museum in Thiruvananthapuram is one of the most renowned and most popular museums in the city and was established by Maharaja Swathi Thirunal Balarama Varma, the former King of Travancore, in 1800 AD. Noted for his love for poetry, music and art, he established the Kuthiramalika Palace Museum in Thiruvananthapuram in order to encourage and promote the traditional forms of Indian art. The Palace Museum is an apt testimony of typical Travancore-style architecture. The interiors of the Kuthiramalika Palace Museum are adorned with royal paintings and the exquisite collections of the Travancore’s imperial family are also preserved there. The intricate woodcarvings only go to enhance the grandeur of the Palace. 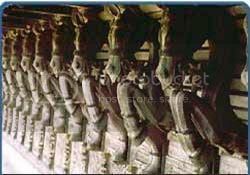 The name Kuthiramalika means ‘palace of horses’ and is derived from the frieze of 122 wooden horses on the exterior walls. The roof beams are designed in the shape of horse faces and its unique architectural design truly reflects the meaning of Kuthiramalika, the horse bungalow.The central location of the Palace Museum makes it easily accessible from all parts of Thiruvananthapuram city. The visiting hours at the Palace Museum are 8.30 AM to 12.30 PM and from 3.30 PM to 5.30 PM. It is a training centre for KALARIPAYATTU, Kerela’s martial arts. It was established in 1956 to revive Kerala’s martial art tradition. 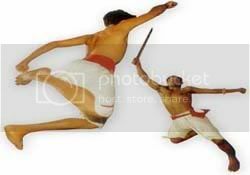 Constant warfare in the 11th century gave rise to KALARIPAYATTU. From it emerged two streams— the CHAVVERPADA, suicide squads, and the CHEKAVAN, warriors who fought duels to the death, in order to settle the nobility’s disputes. At CVN Kalari Sangham each morning students collect at the gymnasium (kalari) to perform a series of exercises that will help them in developing the necessary combat skills. The centre also has a shrine to the deity of martial arts, kalari Paradevata, and an Ayurvedic clinic where students are given oil massages. Ayurveda, which has been practiced in India for centuries, as a traditional system of healing and rejuvenation, is now known worldwide. Tourists come to Kerala from across the world to experience the benefits of ayurvedic massage therapy, which involves treating the body with oils made from medicinal herbs. I am Susan Hannan from Exams Key; it gives 100% TB0-124 Test Questions exams. Let’s take benefit of 7004 Test Questions Exams material efficiently and get guaranteed success. Check out free demo of all certifications Exam. Hi I love your post and it is so good and I am definetly going to bookmark it. I Have to say the Superb analysis you have done is greatly remarkable.Who goes that extra mile these days? Well Done.. Just another suggestion you caninstall a Translator Application for your Worldwide Readers !!! I appreciate you for this post, all is great! Your Posts happen to be above and further than other folks about this topic. Thank you so much for your help.